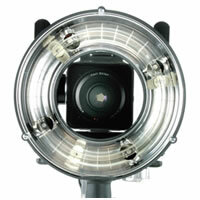 The RF 3000 is dedicated to Elinchrom powerpacks discharging up to a maximum of 3000 ws per exposure. However, in continuous use, the risk of overheating indicates not more than 4 x 2400 ws flashes per minute (or equivalent). To retain ease of handling, the unit has a single 5 m power cable which reduces weight to approximately 2kg. 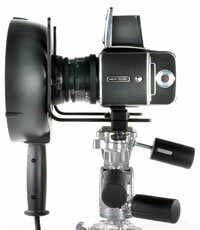 A 200 mm rail with full camera adjustments allows any 35 mm or medium format camera to be conveniently fitted. 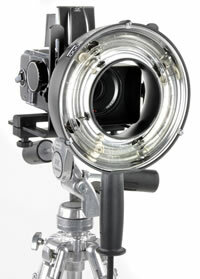 The Ringflash is a unique light source ensuring totally shadow less but concentrated illumination for high contrast or high key lighting. Very popular for fashion/beauty, industrial and much advertising photography.